Screenshot: GoldenEye 007. Graphic: Natalie Peeples. GoldenEye 007 was an anomaly on so many levels. Hailing from storied British developer Rare, it came out two years after the James Bond film on which it’s based, a film that, for people of a certain age, has taken a cultural backseat to the game adaptation. And what an adaptation it was. 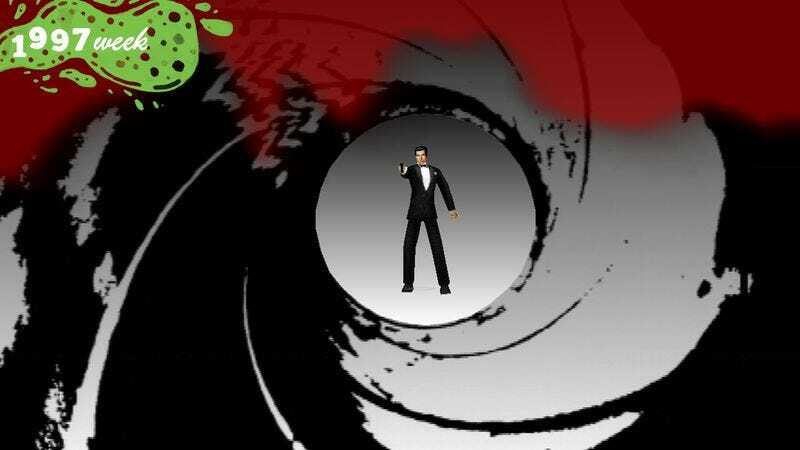 In an era when licensed games were almost universally terrible, GoldenEye wasn’t just a nifty interactive interpretation of Pierce Brosnan’s Bond debut—it was a revolutionary release that proved first-person shooters really could work on consoles. It became one of the Nintendo 64’s most fondly remembered games, thanks in no small part to its freewheeling approach to multiplayer and the hundreds of hours it inspired people to spend shooting, bombing, and slapping the crap out of their friends. For Supper Club Editor Kevin Pang, the time spent with GoldenEye was so formative and impactful that he was never able to move on and capture that feeling with other shooters. I sat Kevin down to look back at his glory days, discuss gaming’s war with accessibility, and answer the toughest question of all: Does GoldenEye hold up in 2017? Matt Gerardi: So Kevin, we’ve been talking about celebrating the 20th anniversary of GoldenEye 007 for a while now. It’s a monumental release and one that has a special place in the hearts of a lot of people. While discussing how we were going to go about honoring it, you told me about your very strong relationship with the game, and I was struck by how different it was from mine. Could you tell us about that? Kevin Pang: I’ll start with a blessedly brief history of my relationship with video games: I was a typical Chinese kid of the early ’90s, wholly obsessed with Nintendo—and only Nintendo. In fact, I owned a device popular in Hong Kong that essentially copied SNES game cartridges onto floppy disks. Illegal, yes, but it fed into my mania. I “owned” hundreds of games and spent a staggering amount of my teenage years staring at a TV screen. Then the Nintendo 64 came along, and I likely logged more hours on GoldenEye than any other game. What made GoldenEye stand out was it being—at least for my high school friends—our first truly communal game. Another N64 game we loved was Major League Baseball Featuring Ken Griffey Jr., but it was mostly played by my circle of baseball-obsessed friends. GoldenEye, however, was a game that even those who didn’t own an N64 could pick up and quickly master. I would dare say the game’s popularity had crossed a cultural threshold and it became a party game for all, like Pictionary or Balderdash. Every weekend between 1997 and 1999, we’d play GoldenEye at our friend Andy’s house, because he owned the largest TV screen, and all of us would bring our N64 controllers over. Hours would disappear. The Man With The Golden Gun, where a one-shot-kill golden gun was placed somewhere in the field, was a particular favorite multiplayer mode. We’d also configure specific weapons for specific stages: rocket launchers only in the Temple or grenades in the Facility. It was always delightful to corner someone in the bathroom and toss a few bombs onto their head for the kill. Here’s the strange thing: Of our GoldenEye cabal (and we’re all now in our mid-30s), none would graduate to an Xbox or PlayStation. None of us play many games today. Our video game growth was stunted with GoldenEye. MG: But that’s not for lack of trying, right? Did you try playing the shooters that were released in GoldenEye’s wake? I think the real reason goes back to the intuitive pick-up-and-play appeal of GoldenEye. Despite the strange contours of an N64 controller, especially when seen as an evolution of the SNES controller, it felt familiar in the hands. I hate to sound like a Luddite here, but for many of us the N64 was the upper limit to our command of video game language. I took two years of college Japanese, and by the end of that I had hit a wall on comprehension unless I seriously invested mental energy. The same is true for gaming—as titles became more advanced and controls more robust, the learning curve for me got steep in a hurry. I did own a PlayStation 3 for a hot minute. One day it fizzed out and stopped working, and it never occurred to me to replace it. I remember buying and quickly giving up on Call Of Duty 4: Modern Warfare because I was utterly confounded by a PS3 controller. Coming from GoldenEye, where my responsibility was to move, shoot, and reload, committing the move sets of COD to muscle memory required learning a new language. This explains why my enthusiasm for video games in my 30s could never match my fanaticism as a teenager. MG: I don’t think there’s anything Luddite about it. As you said, learning to play video games is like learning a new language, especially in how it’s much easier to pick them up in your younger years. Most people who are unfamiliar with the dual-stick controls that became the standard in the years after GoldenEye have immense trouble grasping them at first. I’d say it’s probably the single biggest hurdle to modern gaming that there is. And as your case shows, I imagine it’s twice as hard if you cut your teeth on a game like GoldenEye, where, by default, the duties of the second stick are carried out by four buttons on the front of the controller and the developers kindly added copious amounts of automatic aiming to help smooth out the experience. With hundreds of hours of habit-forming play, moving on to games that demanded a completely different way of just plain functioning inside them sounds like a nightmare, and that’s not even considering having to worry about which button makes you crouch or jump or sprint. I wrote about this a bit when Mario Kart 8 Deluxe hit the Nintendo Switch earlier this year and included a few options that make it way easier to play, like automatic steering assists. When you’re in this game enthusiast bubble, constantly playing and thinking about new games, you tend to forget that accessibility is a serious issue for this entire medium. There are certain things you can learn about music or film that’ll deepen your understanding, but you don’t have to develop fine-motor skills just to experience them. KP: As our esteemed video gaming editor, I need to ask you: Why do you think GoldenEye became so immensely popular? And how does the game hold up 20 years later? MG: Now you’re asking the tough questions, Kevin. Well, there are a handful of reasons GoldenEye became the landmark that it was. First off, it was the closest a developer had come to working out a way to control first-person shooters on a console that wasn’t wonky as hell. Like you said, it was simple enough for a lot of people to quickly jump into and enjoy, something extra necessary given the Bond license it carried. And even more impressive, if you dive into GoldenEye’s options and flip through the many available control schemes, you’ll find a couple of layouts that get remarkably close to the one shooters use today. “Solitaire,” which puts movement on the D-pad and looking around on the stick, is nearly there. And it’s super awkward, but you can play the game with two controllers at once to effectively achieve a dual-stick setup. The setting called “Galore” is pretty much right on the money. But that’s one small part of it. More importantly, GoldenEye was a tremendously flexible game when it came to the multiplayer, allowing you to rearrange all sorts of rules about what weapons were on the maps—slapping only, mines only, etc.—what characters you played as, and any cheats you’d want to activate. That’s something that not even many shooters on the PC were offering out of the box. It allowed you to develop your own house rules and take ownership of the game, and that was a big step for multiplayer. As for the question of how it holds up now, well, I fall in the “it does not” category. Even at the time, I never really jibed with the C-button–driven controls, and trying to go back and play with them today proves to be an unwieldy nightmare. I’m basically the polar opposite of you. For me, Halo was the game that prompted the same ritualistic years-long obsession that you described. In a lot of ways, it was the truest GoldenEye successor, in terms of influence and impact. They both made huge leaps forward for the way we play shooters on consoles, of course, but they were also the definitive social games of their respective generations, with Halo even carrying on the deep multiplayer customizability that made GoldenEye so beloved. The difference is, Halo came at a time when controller design was finally becoming standardized, and the layout Bungie went with—move with the left stick, look with the right stick, shoot with the right trigger, distribute your games’ specific functions elsewhere—became the norm. Having spent thousands of hours with that game and all the shooters that followed, going back to GoldenEye and using some backward combination of buttons to get around is just as impossible for me as moving on has been for you. To borrow a metaphor you used to describe yourself, the game feels like it’s stuck in amber, an important evolutionary step between the messy, disparate attempts that came before and the perfection that would come four years later. But hey, that’s just the opinion of one lousy youngster who never liked GoldenEye all that much to begin with. KP: It wasn’t long ago that I snickered at my parents—who still only listen to Elton John, Paul McCartney, and the Bee Gees—for being unhip in their musical choices and unwilling to open themselves up to newer tastes. Who doesn’t see the generation before them as fuddy-duddies? So I wonder if young players today see GoldenEye as being as antiquated as 8-track tapes. I’m going to go with probably. It doesn’t seem to have the nostalgic value of, say, the Super Mario series, because it’s not old enough to be 8-bit retro but not new enough to hang with more modern titles. But you know what? God bless my folks for listening to “Goodbye Yellow Brick Road” for the 378th time this week; they like what they like because it makes them feel comfortable. Like with all art, it’s the relationship with the person experiencing it; it’s in the eye of the beholder. “Does it hold up” for you, Matt, is an objective question—your purview as a gaming fanatic allows you to answer that in relation to other titles since it was released. For me, “does it hold up” is a subjective question. I no longer own a video game console. I do, however, play with the emulator on my MacBook a few times a month. I loved GoldenEye. Correction: I love GoldenEye. That statement being in the present tense means my answer to “does it hold up” is an emphatic yes.